Rango is an upcoming computer-animated comedy film, directed by Gore Verbinski and produced by Graham King. It features the voices of actors Johnny Depp, Isla Fisher, Bill Nighy, Abigail Breslin, Alfred Molina, Harry Dean Stanton, Ray Winstone, Ned Beatty, and Timothy Olyphant. This is the first film produced by ILM, generally a special effects company. The CGI-animated film was produced by Industrial Light & Magic (ILM), with post production at Gore Verbinski's production company, Blind Wink. This is the first film produced by ILM, generally a special effects company. During voice recording, the actors were given costumes and sets to "help give them the feel of the Wild West". Star Johnny Depp had a 20-day window in which he could voice his role as Rango, and the filmmakers scheduled the supporting actors so as they could do their scenes with Depp and interact with him. Verbinski said his attempt with Rango was to do a "small" film after the large-scale Pirates of the Caribbean trilogy, but that he underestimated how painstaking and time-consuming animated filmmaking is. 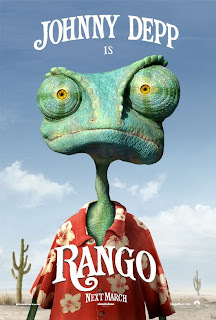 Rango's announcement video was released on June 9, 2010, along with the film's official site RangoMovie.com. The announcement shows an open highway and a wind-up orange plastic fish floating slowly across the road. On June 28, 2010, the first poster was released, showing the character Rango. A teaser trailer was released on June 29, 2010, and was shown in front of The Last Airbender on July 1, 2010, Despicable Me on July 9, 2010, and Megamind on November 5, 2010. The full-length theatrical trailer was released December 14, 2010, then shown in front of Yogi Bear, True Grit, and Justin Bieber: Never Say Never.. The trailer was fully shown on TV during a Nickelodeon airing of iCarly. It features the song "The Whip" by Locksley. Electronic Arts is scheduled to release a video game based on the film. It is rated E10 and will be released for the PlayStation 3, Xbox 360, Nintendo DS, and Wii.